Team Mousetalgia reminisces over the past year, and we share our thoughts in our annual New Year show. 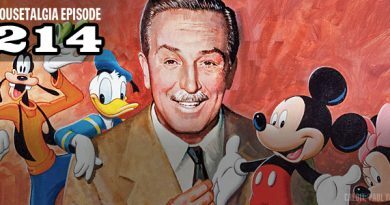 Topics include the best additions or changes to Disneyland; the best Disney movies (apart from Star Wars!) and our analysis (Cinderella, Inside Out, and Tomorrowland are contenders); our best theme park dining experiences (the Blue Lagoon at Disneyland Paris, Carthay Circle, Catal, and of course, Club 33); our favorite purchases (autographs, a Club 33 mug, Disneyland Paris APs and an original Mary Blair make the list); our annual Oswald Awards (including the release of the Good Dinosaur, Disneyland’s popcorn, Disneyland APs, and the planned demise of Frontierland); and our favorite Disney-related events (such as seeing “Newsies” live at the Walt Disney Studios, meeting Peter Renaday, and, of course, Disneyland Paris). Plus – our New Year’s resolutions for 2016 – and more.